How much is done to protect loggerhead turtles against their main threats? Read the stories of people who work to protect this beautiful species. A story by Theodota Nantsou, Head of Policy, WWF-Greece. 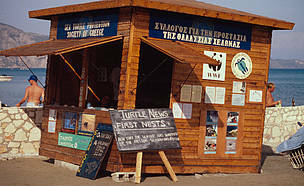 STPS/ARCHELON (Sea Turtle Protection Society of Grece) and WWF Information Centre on Laganas beach, Langanas Bay, Zákinthos, Greece. The loggerhead turtle: friend or foe? Zakynthos island, in the Ionian Sea, is one of the most famous destinations for mass tourism in Europe. At the same time it hosts the most important nesting grounds for the Caretta caretta, the loggerhead turtle in the Mediterranean Sea. 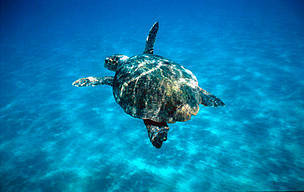 Loggerhead turtle (Caretta caretta) swimming in open sea. 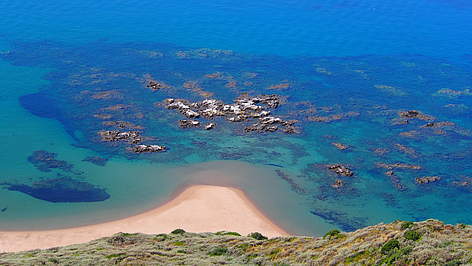 Zákinthos, Lagana Bay, Greece.